Have You Gotten Your Free Chocolate Yet? You are here: Home / Be Cheap / Freebies / Have You Gotten Your Free Chocolate Yet? Visit RealChocolate.com every Friday to get a coupon for a free Mars candy. You can get one coupon each Friday between 9 a.m. and noon (ET) for a total of four coupons per household. Each Friday Mars gives away 250,000 coupons, so your odds of getting one are good! You can use your coupon to get a free single size M&Ms, Snickers, Dove, Twix, Milky Way, or 3 Musketeers candy bar. 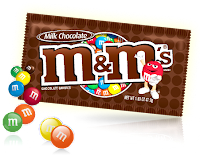 The Mars Chocolate Relief Act ends September 30, 2009, so there’s still time to get all of your coupons. You can even have Mars send you an e-mail reminder every Friday, so you don’t forget to sign up.